Ida Florence Smith Allen, daughter of Oather and Maudie Bates Smith, was born on August 27, 1945, in New Port, Arkansas. She departed this life, January 19, 2019, at Lake Regional Hospital, Osage Beach, Missouri at the age of 73. On August 28, 1963 in Kansas City, Missouri she was united in marriage to Orlin Gene Allen and to this union three children were born. Together they shared 55 years of marriage. She was preceded in death by her parents and brother, Oather Smith, Jr.
She is survived by her husband, Orlin Gene Allen of Camdenton, Missouri,; daughter, Angela Allen of Camdenton, Missouri,; two sons, Jason Allen and wife Lori of Kaiser, Missouri and Rodney Allen and wife Lisa of Osage Beach, Missouri,; six grandchildren, Jocasta Williams and husband Cody of Lebanon, Missouri, Eugene Oliver, III of Camdenton, Missouri, Jacob Allen and wife Mandee of Eldon, Missouri, Jordan Allen of Kaiser, Missouri, Joshua Allen and wife Lilliah of O'Fallon, Missouri, Justin Allen and wife Katie of Camdenton, Missouri, Jacob and Josh Oliver of Osage Beach, Missouri,; eight great grandchildren; two sisters, Joyce Jackson of Kansas City, Missouri and Wanda Deluca of Weatherby Lake, Missouri,; and a host of nieces, nephews, other relatives and many friends. Ida spent the early part of her life living in Kansas City, Missouri before moving to Camdenton, Missouri in 1979. Ida made a profession of faith, was saved at an early age and was a member of Pleasant Hill Baptist Church. 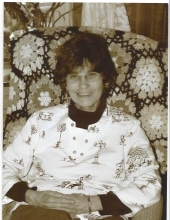 In her spare time she enjoyed gardening, woodworking, quilting, ceramics, scrapbooking, and genealogy. She loved the Christmas season and spending time with her family. You could find her helping out with the mechanic shop and keeping the guys in line. Memorial donations may be made to the choice of the donor and left at the funeral home. To send flowers or a remembrance gift to the family of Ida Florence Allen, please visit our Tribute Store. "Email Address" would like to share the life celebration of Ida Florence Allen. Click on the "link" to go to share a favorite memory or leave a condolence message for the family.